Cineworld Unlimited cards are great. £15.99 a month, and you can see as many films as you like, as many as you can cram into one day. While a working week often puts a dampener on any mid-week cinema plans, the weekends are made for abusing the Unlimited card. Last Saturday I went to Cineworld and made myself at home. Armed with my Unlimited card (premium now, so 25% off snacks) and a meticulously planned film schedule, I settled in for the long haul. Not one to ease myself in, I launched straight in with Elysium. It wasn’t entirely what I was expecting, but good none-the-less. A stand-up sci-fi film, though it does contain some much used clichés (countdown timer anyone?). I found it quite refreshing that for a change the protagonist was less concerned with saving the world, and was all about saving his own bacon. 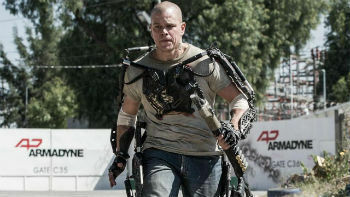 Altogether, I had expected Elysium to be more visually spectacular with a more strongly driven story. Though I hadn’t expected much from the film, I had anticipated it being a bit more revolutionary and out of the ordinary. Elysium was a thoroughly standard film, just not entirely what I was expecting. Out of Elysium and straight into We’re The Millers, which could not have been a more different experience. Whilst We’re The Millers doesn’t stand out as being a brilliant comedy, it is by no means a terrible film. Unlike Elysium, We’re The Millers basically lived up to my expectations. It did have funny moments, but now, some five days after seeing the film, I’m struggling to remember a single joke that I laughed hard at. At times, the chemistry between Jason Sudeikis and Jennifer Aniston seems a little forced, but again, better than in some films that I’ve seen. There are some awful, cringeworthy moments, but these are soon over with, and the audience are left with an average comedy as a result. Two films in a day is more than enough for most people, but for me, it was a mere halfway point. Time for an important break, lunch and some much needed fresh air (which would have been much more enjoyable if it wasn’t pouring down with rain). For anyone considering the four film trip, I would recommend having a nice long lunchbreak, trying to stay away from screens of any kind (my iPad, iPhone and the It Box in the cinema and pub opposite meant I probably struggled with a headache for longer than I needed to). Out of lunch and (almost) straight into film three, The Mortal Instruments: City of Bones. This was probably the film of the day I was least looking forward to. A sort of pseudo-Twilight teen fiction film, The Mortal Instruments tried to dip itself into a few genres and tick off a few of the core plot fillers. I think the film spread itself a little thinly over a lot of plot, and tried to cram in too much. Whilst there have been grumbles with other books being split into two films, often it is necessary, especially in instances like this when a whole new world and mythology has to be introduced. Having said that, the film moved quickly and didn’t lack action, but perhaps would have benefitted a little more time with characters, learning their motivations and allowing us to feel more of an affinity to them. Partway through The Mortal Instruments is when I hit my film wall. My bum was numb, I was getting fidgety. I could feel the mother of all headaches coming on, and I was in no mood for the next film to be complicated, or anything that required me to concentrate too hard on. Luckily, the fourth and final film in my day of cinema was Pain and Gain. Thoroughly ridiculous, and frankly, totally unbelievable as a true story, Pain and Gain is the story of three bodybuilders who seek to take the wealth and lifestyles from their rich clients. I had expected the film to be more about the trio enjoying the wealth they have acquired, but there is a lot of focus on the planning and the actual acquisitions. The plot of the film has obviously been dramatised, and it makes you wonder how much of the story has been fabricated; how would it be known that one of the characters fed his toe to a dog? Again, another okay film, for what it is and as a piece of cinema which is designed purely to entertain and not to evoke any strong feelings, it sets out what it aims to do. An enjoyable day out, in all, and a variety of films watched; I’d say if you’re considering doing a four film day the key is to mix it up with different genres and film styles. The Unlimited card meant instead of spending £36 on cinema tickets per person, we got our month’s money’s worth in one day, anything after that is just a bonus. Some people love high school slasher films, some people like mall cop films. Myself, I like most films, but I have a real soft spot opening up for that favourite genre “magic films”. As a Cineworld Unlimited customer, I am invited to the preview screenings the chain hold for upcoming films. Mostly, I let these pass me by as I always think I’ll catch the film at a later date anyway, and as screenings are on a Tuesday, I’m never with my cinema-going partner in crime. This screening was too good to pass up – even my parents went, sucked in by the excitement surrounding the event. This screening was a tip-top secret. Cineworld invited all us Unlimited customers without telling us what the film was, revealing clues along the line. Tension mounted as the cinema workers remained tight lipped whilst being grilled by customers. Fellow guests fidgeted and whispered through the trailers as they tried to guess what was coming next. Suddenly, Jesse Eisenberg’s giant head filled the screen and he and his cast members introduced our next two hours. The film focuses around a newly created magical act, The Four Horsemen comprising of Jesse Eisenberg, Isla Fisher, Woody Harrelson and Dave Franco. The Horsemen have been instructed to put on three magical shows across America, whilst dodging the grasp of FBI agent Mark Ruffalo, as their stunts become more daring and less legal. The group dynamic works well, though at times it feels as if there is not enough focus on the relationships between characters. Certainly, the relationships are alluded to, but it often feels that the story will return and never does. The group has the benefits of each member having specialist skills, and the plot moves along allowing all team members equal screen time, but overall, being overshadowed by Mark Ruffalo who quickly becomes the central character, often stealing the show. I thoroughly enjoyed Now You See Me. The film felt fast-paced and the plot moved on with ease. The concept of three magic shows was introduced early on in the film, and this certainly helped with the pacing of the film, as the audience was left waiting to see what the Four Horseman could pull off next. Though some tricks were a little unbelievable, for the most part things were explained as Morgan Freeman’s character sets out to debunk the magic behind the tricks of the most popular magicians. Now You See Me was a great choice for the secret screening, with the genre and plot of the film adding to the mystery shrouding the whole night. I would recommend the film to anyone looking for an interesting film, with plenty of twists and an exciting new concept. Cinema trips used to be few and far between, but since taking on the Cineworld unlimited card offer, I can now find myself in up to three screenings each weekend. If I wrote reviews for each film see, I’d be here all week, and let’s face it, there are plenty of reviews around for a lot of the huge blockbusters out there. I’ve chosen to write a review about The Purge as I feel it’s going under the radar a bit. Prior to entering the screen, I’d never heard of the film, let alone what it was about. The film is set in America in the near future, where there are strict laws – except on one day of the year. On this day, anything goes, any crime is permitted. This day is when citizens are permitted twelve hours to go on a crime “purge” to cleanse their souls of the anger that may otherwise cause them to commit crime. 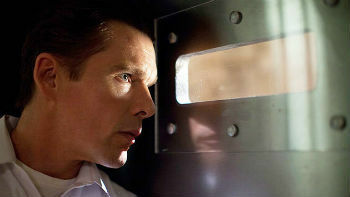 Ethan Hawke is a salesman specialising in security equipment designed to protect families from people participating in the purge. His wife, Lena Headey, is left to deal with the scrutinising stares of neighbours who feel her husband is capitalising on their fears. They live with their two children in their grand house, and all is well. The plot of the film centres around the struggle of the family to cope as their purge plans go awry. I don’t want to go into too much detail for fear of entering spoiler territory, but the house doesn’t turn out to be quite the fortress it was designed to be. The Purge turned out to be a pleasant cinema experience. I wouldn’t say it was excellent, but it certainly isn’t poor either. The film remains tense throughout, and is well-acted. There are questionable comedic moments which I wasn’t sure were made to be intentionally funny or just missed the mark. Coming out of the screening, I heard a lot of people grumbling that The Purge hadn’t lived up to their expectations. Having gone into the film with no expectations at all, I found it to be perfectly enjoyable and watchable. I can’t say it’s a film that I would necessarily want to own, or indeed watch again, but as a bit of fun on a Friday night, it was fine.